If you're reading this, I hope you don't have to go through heart surgery with your child. But even if you don't, I hope that this gives you an idea of how life is in the hospital. Before Evie's heart surgery, I was desperate for any information I could use to feel prepared to live in the hospital for a couple weeks. Fellow parents on local Facebook groups were so helpful in speaking from their own experiences. But I couldn't find anything online where someone wrote it all out. So in the hopes that this helps someone, here goes. Toiletry bag that hangs (no counter space in the bathrooms)--don't forget shampoo and conditioner and soap because none of that is provided. Hoodie--it gets cold in the ICU. Slip-on shoes so you can get out of bed quickly if your child needs you (or throws up in the middle of the night and you need to run around getting things). Sound machine for your little one (or you) because it's noisy during the night, esp around the nurses' station. I purchased this one and it was great. My previous blog post on Pre-Op is here. 1. Room Situation. There are varying types (doubles and singles) and sizes of rooms (rectangular, square, and trapezoidal). It's really up to how critical the child is and what empty rooms there are. I think we were pretty lucky. We were in the first hallway near the entrance, but not next to the door so that it was too noisy. Evie got a room to herself. The baby next door to her got a smaller room. Another family we met had to share a large room with several other patients, with only curtains between them for privacy. 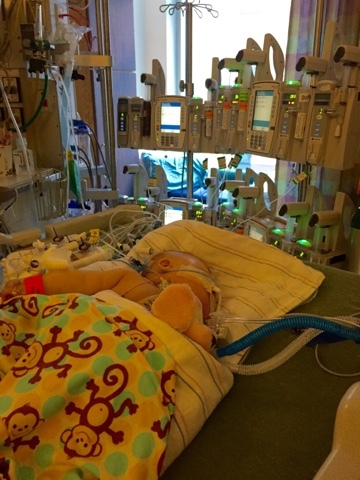 It's really hard to see your child hooked up to all the tubes and wires. Sometimes they leave the chest open due to excess fluid. Another mom told me to prepare myself, so I am giving everyone the heads up as well. Luckily, Evie didn't need to have her chest open afterwards. 2. Sleeping Situation for Parents. Honestly, the sleeping situation is great. Because if your child is sedated, this is the best time to go home and sleep. I felt immense guilt at first, but the doctor and the nurses encouraged us to go home. And when you realize that this is the most qualified and most expensive babysitter you'll ever have, you will gladly go home and enjoy it. Having been a NICU parent already for 6 weeks, I wasn't as torn about this as other moms might be. 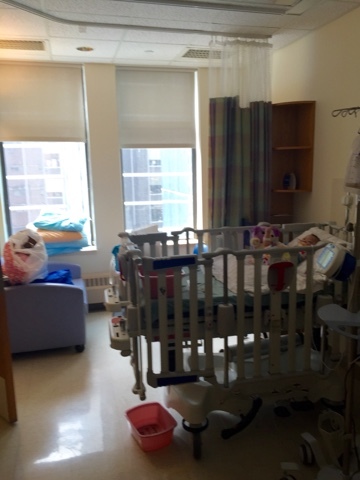 There are sleeping rooms on the CICU floor and elsewhere that you can sign up for in the Center for Families once you have an official ICU parent badge (from the information desk). If you do want to sleep in the ICU, there is a nice bench, cubby, and a privacy curtain with your name on it (for one parent). It's literally a window seat with a cushion about 3" thick. It's actually not that bad--I prefer the bench to the pull out arm chair in the step down unit, but because there's no shower or bathroom. A note to the wise--pull down the window shade before you change your clothes--there's a privacy curtain for the people in the hallway, but don't give a show to the people across the courtyard! 3. Bathroom Situation: Just 2 single bathrooms outside at the front desk. 4. Food Situation: No food in the ICU rooms. You have to keep your food in the family lounge and put a label with your name and date on it. You can bring a covered drink into the ICU though. You will start to hate the words Au Bon Pain, because that is the most convenient thing to eat (the cafeteria is under construction for the next couple weeks). There's also a Red Mango. Outside the hospital are Bertucci's, Boloco, Starbucks, and the Longwood Galleria Food Court. 5. Electronics: Phones and tablets and such are allowed, but you have to be careful to stay away from sensitive equipment (best to check with your nurse). 5. The Staff: We were impressed with every single nurse and doctor we met. The front desk staff were nice, but had to enforce the have-you-been-out-of-the-room-for-20-minutes rule. If you had, then they had to call and make sure the nurse wasn't doing anything that couldn't be interrupted. 1. The Room Situation. It's a crib, an arm chair, a TV, and a bathroom. If you are lucky (and staying longer than a couple nights), you will hopefully get a single room in the step down unit. If you are not lucky, and if there is another patient the same age as your child, you will probably get a double. 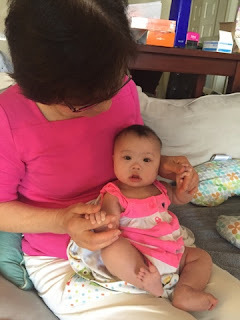 Initially when we came for catheterization and Evie had to stay overnight, we were in a double (i.e. the worst room). 2. The Sleeping Situation for Parents. Imagine a vinyl-covered arm chair that pulls out. It's the kind in which your significant other might have slept in the Labor and Delivery room. Can you feel the metal bar poking you in the lower back as you lie down? If you're sleeping there more than one night, you probably understand that you'll want a foam egg crate mattress cushion. It's worth the $14 at Target. 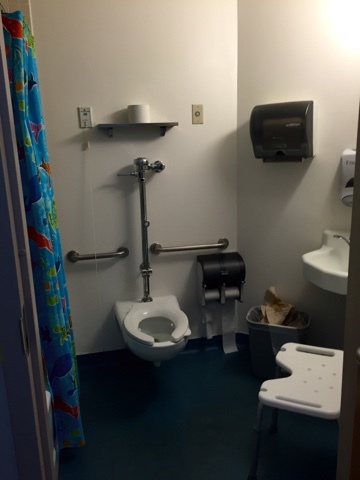 The Worst Room in the Place: One of the moms on a Facebook group had warned me that the worst room on 8 East was the one across from the Treatment Room, where babies get their blood drawn, stitches removed, etc. She was right--we heard babies screaming all night. 4. The Bathrooms. In the double on 8 East, the bathroom was on the other side of the room, so we had to disturb our roommates whenever we went to the bathroom. This can be awkward in the silence of 3 am. And the shower was seriously about as wide as the arm chair. If you get a double and need more room to move around to do your bathroom routine, look for the Tub Room near the entrance to 8 East. 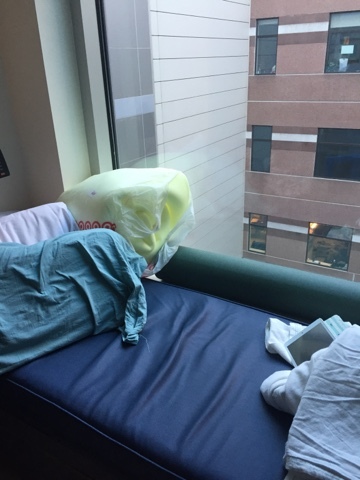 When we came back after the Cardiac ICU, Evie got a cushy single across from the nurses' desk. This was WAY better, and even had a tub (but who would actually have the time to have a leisurely bath while their kid was in the room??). 5. Flat screen TV. There's also a Playstation in every room. There are babies, little kids, big kids, and adults recuperating in this unit, so I think the Playstation is for the big kids (or adults who are still kids inside). 6. Electronics. You are allowed to use your phone and electronics in the step down unit. Some of you have asked me how I could keep up with my blog when there was so much going on. I typed with my thumb while I held a sleeping or g-tubing Evie. There was nothing else to do! 7. Nutrition Room on 8 East: This room has the parents' fridge, as well as a water/ice dispenser. There is a supply of apple juice, ginger ale, milk, jello, popsicles, crackers, and bread. I definitely helped myself to the apple juice, which somehow I am now addicted to after having Evie. Yes, there are perks. When you've just dropped off your child in pre-op, your heart is heavy and you need somewhere comfortable to go. If you are interested in keeping your sanity during a stay, we highly suggest visiting the Center for Families. This new center is solely for the comfort of the families. There are computers, sitting areas, toys for siblings, a library, a lactation room, a microwave, and a copy/fax machine. Free coffee and sometimes Starbucks snacks too. 2. This is Erick's favorite: MASSAGES. By the 3rd day there, the staff in the Center for Families knew our names. I'm slightly embarrassed, but not enough to have done things differently. Every Tuesday is Chair Massage Day in the Center for Families. Tuesdays are also the day for chair massages in 8 East. SO if you are smart like my husband, you sign up for TWO massages on Tuesdays. 3. Chair Yoga. I've never done it, but hey, why not. Dr. Emily Davidson, the former director of the Down Syndrome Clinic, is the one who runs it on Fridays. It was a nice escape from the monotony of the hospital room. She even handed out little cotton rounds with lavender oil for some aromatherapy. 4. Reiki on Mondays and Wednesdays. I don't know much about Reiki, and still don't, but basically a Reiki practitioner (a nurse) touches you with her hands while you listen to relaxing music and lay on your back on a massage table. Apparently when Erick had it, the nurse's hands got really hot and she said he had a lot of "energy" around his head and neck. I told him it was because he had "hot air." Haha. For me, I didn't feel much different--just sleepier. It was nice to just lay there for 30 minutes. 5. Play Room. In each wing of 8 East and 8 West, there is a play room for kids of all ages. I thought they wouldn't have anything for babies Evie's age, but they definitely did. Lots of books and toys. The Child Life Dept does an awesome job in making these available. 6. Food Trucks. If and when you get sick of food from Au Bon Pain and the Longwood Galleria, there are a couple Food trucks that come each day in the driveway at the employee entrance downstairs. We had some good burgers and Hawaiian food. I also saw trucks for macarons, ice cream, and BBQ. 7. Sleep Rooms. Sign up for one of these in the Center for Families early in the day, or you won't get a spot. If you live too close to Boston Childrens, you can't get one of these. One parent can stay in the room with your child, but the other would have to make other arrangements (unless you co-sleep and want to cram into the bed with your child). 8. Social Workers. Our social worker was extremely helpful towards the end of our stay. She made sure we got the medications we needed for Evie, even when it meant calling several pharmacies to see if they had Sildenafil in stock. She was still trying to find it for us at 4:30 pm on a Friday afternoon, and didn't leave work until she knew we had what we needed. She also put us in touch with someone to help us apply for secondary insurance for Evie. Navigating the system is no easy feat, so we are very grateful. So that's what we learned during our heart surgery adventure with Evie! Hope it helps someone as their child joins the zipper club! Feel free to add comments with your own suggestions.